Maple Glazed Sheet Pan Salmon is an easy way to enjoy seafood with a fall theme with only 10 minutes of baking time. Simply give it a quick marinade and roast in a sheet pan for easy cleanup. Well, fall is officially here. Not sure how that happened as I swear it was July just a month ago. It’s amazing how time flies, especially when you’re busy. We just returned from a two week trip to Russia. Coming back to an almost empty fridge means quick and simple meals are a plus. 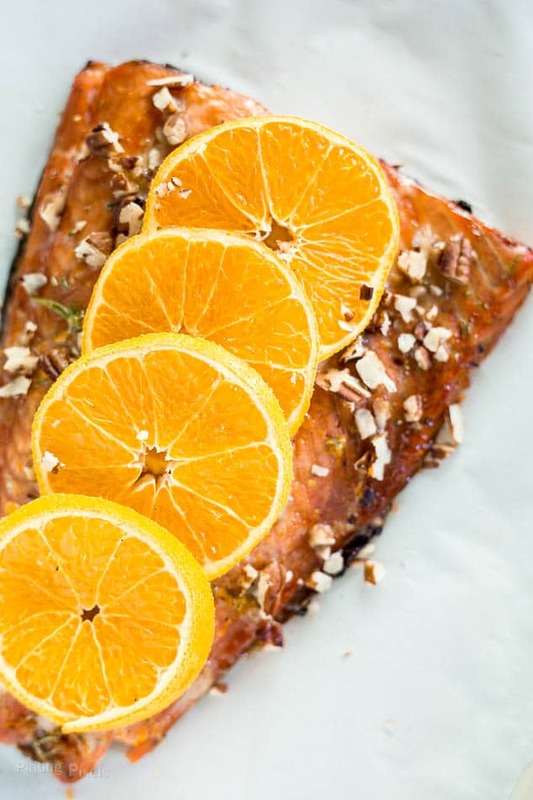 Recipes like this Maple Glazed Sheet Pan Salmon with Citrus requires minimal ingredients, most of which you probably already have stocked. Preheat oven to 400° F. Place salmon on a foil or parchment lined baking sheet skin side down. Bake 8-12 minutes, depending on thickness, until center is cooked and meat flakes with a fork. Cover pan with foil or parchment paper. This makes cleanup even easy and prevents food bits or sauce sticking. No soaking needed. Try adding veggies to bake at the same time as the salmon, such as asparagus, tomato, zucchini, cauliflower or broccoli. Roasting smaller items of food is better. Sheet pan cooking is meant to be quick and easy. Cut up veggies such as potatoes, asparagus, bell pepper, and onion. Meat should also be cut into roughly 1-inch chunks, unless it’s thinner items like salmon or thin cuts of meat. Don’t crowd the food. If cooking items such as potato cubes, veggies or meat, make sure they are not packed too tight. A bit of space allows quicker, more even roasting and toasts the food a bit. Use different cooking times for different ingredients. Denser foods take longer to cook and should be staggered. For example, if cooking potatoes with meat, start with potatoes for about 15 minutes, then add the meat and finish cooking. This Maple Glazed Sheet Pan Salmon is best with fresh wild-caught salmon. Also, use high quality 100% maple syrup, instead of a maple flavored syrup. Toasting the pecans ahead of time will add extra roasted flavor. 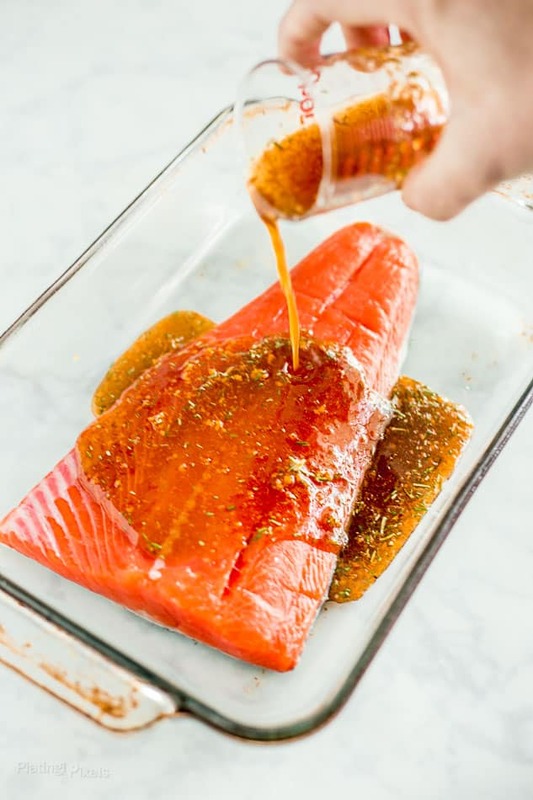 I also recommend marinating the salmon in the maple syrup mixture ahead of time to allow flavors to soak in. I like to buy meats in bulk or when on sale, then freeze for later usage. When salmon goes on sale, buy at least a few pounds and freeze. 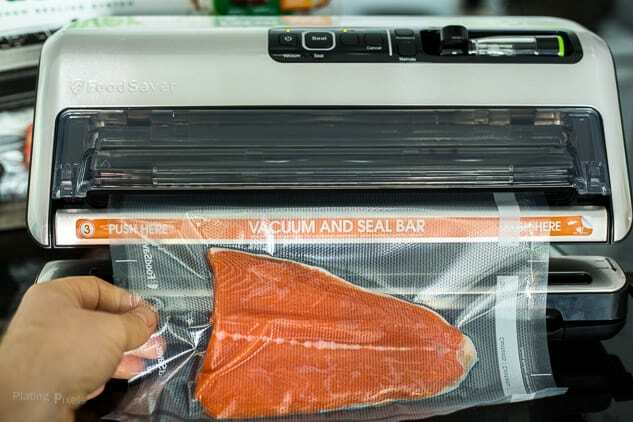 The FoodSaver FM5330 Vacuum Sealing System is ideal for this. It keeps food fresh for up to 5x longer than ordinary storage methods like zipper bags, plastic wrap, and containers, and helps prevent freezer burn. Multi-layer, BPA-free FoodSaver Heat-Sealed Bags 6-pack are flexible enough to hug food and seal effectively without gaps, and best for long-term freezer storage. This baked salmon would be delicious served with potatoes, either mashed, roasted or as a potato salad. Or try serving with roasted or grilled veggies, or a freshly made salad filled with fresh vegetables and greens. I haven’t posted many sheet pan recipes, actually just these Sheet Pan Honey Mustard Pork Chops, but that should change now that it’s oven appropriate weather. What’s not to love about sheet pan cooking? Everything is cooked at once and requires one pan for easy cleanup. 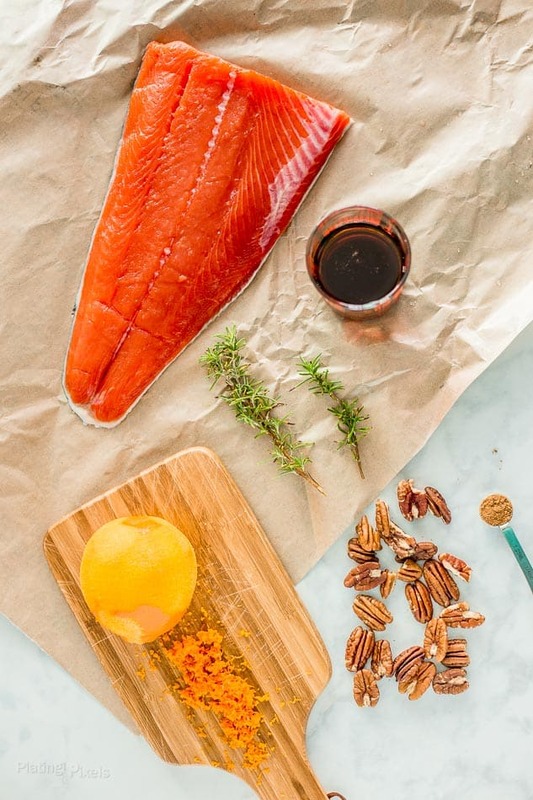 Maple Glazed Sheet Pan Salmon with Citrus is a quick and easy fall-themed seafood recipe full of lean protein. Roasted in one pan for easy cleanup. Toast pecans over medium-high heat, stirring often until lightly browned and fragrant. Let cool, chop and set aside. In a small bowl, stir together maple syrup, orange zest, rosemary, salt and pumpkin pie spice. Pour mixture over salmon in a shallow baking dish. Marinate in fridge 1 to 4 hours, rotating halfway. Preheat oven to 400° F. Place salmon on a foil or parchment lined baking sheet skin side down. Discard extra marinade and top salmon with orange slices. Bake 8-12 minutes, depending on thickness, until center is cooked and meat flakes with a fork. Top with roasted pecans and salt to taste if needed. Serve immediately. Roasting on foil or parchment makes for easy cleanup. Discard it after roasting and give baking sheet a light clean. 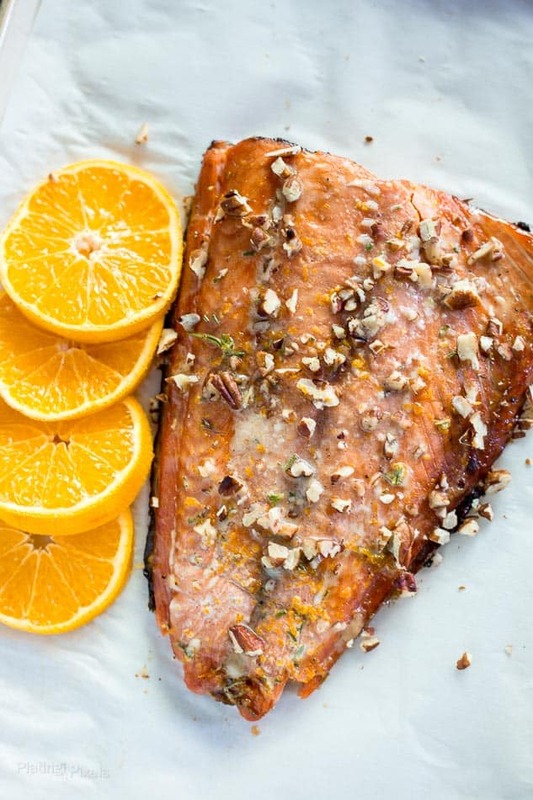 This salmon looks perfect and such a good way to enjoy salmon in the autumn! It sure is and thanks Amy! Thanks for the feedback Linda. I agree it’s not always easy to find, even in health food stores, but the flavor and texture is so much better. 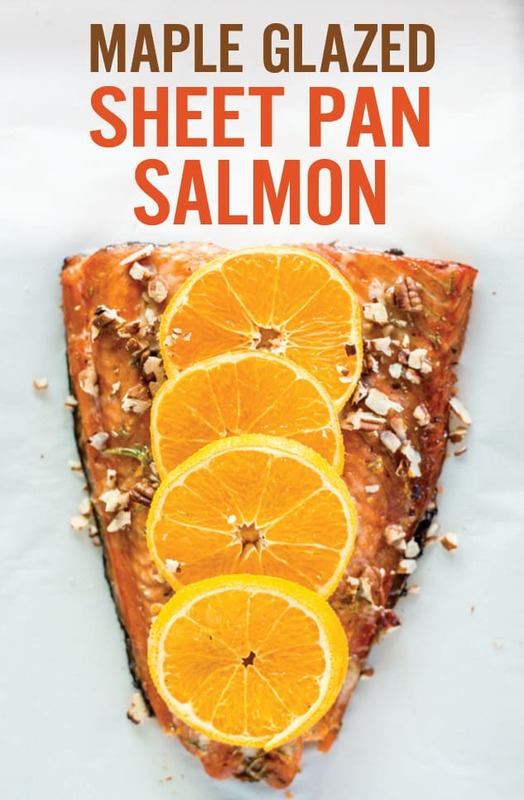 I love sheet pan meals and salmon is my favorite, so I must make this for supper. I agree with you that wild caught salmon and pure maple syrup are worth the expenditures for taste and quality. Glad you agree Jere! I love sheet pan meals too and need to start cooking them more often. What a great flavor profile. The best part is that it is done as a sheet pan meal in the oven. Less effort and big flavors. Yep it makes it quick and easy to cook and clean. Thanks Sonal! I just love sheet pan meals! And this orang and maple glazed salmon looks amazing. Thanks so much for the tips for making delicious one pan dinners… I have definitely learned the hard way! Salmon is such a favorite dinner at our house. Love the fall flavors going on for this salmon. Seafood in general is a favorite here, but especially salmon. Thanks Taylor! Be still my beating heart! I love Salmon and anything citrus!!! Question have you made this with blood oranges before? If so what where your thoughts on the flavor? My husband planted one a few yrs ago and during season I have a ton. Let me know. I can’t wait to try your recipe!!! I haven’t Heidy but that’s a great idea! I bet the colors would be amazing. I haven’t had them much but remember the were a bit richer and less tart, so I’d say go for it!